WARRENSBURG, Mo. 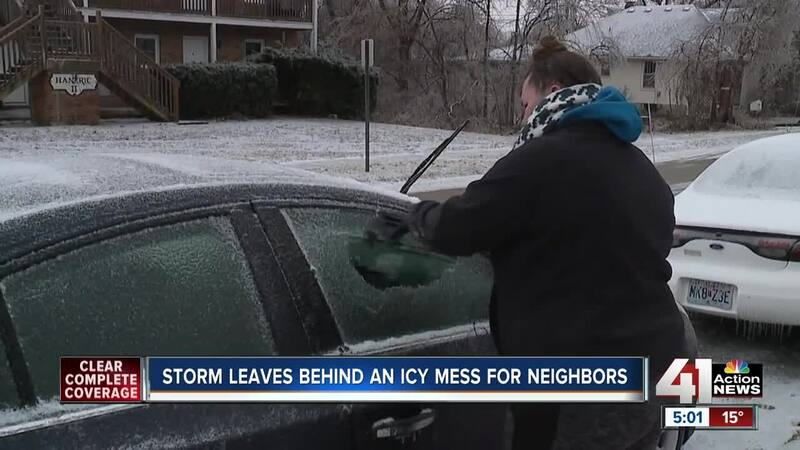 — While metro roads iced over and students stayed home Thursday, the latest bout of winter weather to bludgeon the area also affected cities southeast of Kansas City, with ice accumulating on roads, trees and cars, and causing power outages along the way. After receiving an overnight glaze of ice, officials in Warrensburg, Missouri spent Thursday monitoring conditions in hopes the winds didn’t gust up and cause tree branches to fall on live power lines. Despite calls to stay inside, resident John Nold was outside trying to keep up with the storm. “This is the second time I’ve cleared off this driveway,” Nold said. “I did it yesterday and again today. It’s got three-quarters-of-an-inch on it again. It’s a routine the 78-year-old Nold is not fond of. “You can break your neck out here,” he said. Across town, Kayla Harris was one of many forced to scrape her car free from a blanket of ice. “I wasn’t planning on going anywhere, but I know I have to work tomorrow and so I’d rather do it today,” Harris said. The weather made Harris dream of much warmer times. “I wish I was in a tropical area right now,” she said. Tropics or not, the city deployed six snow plows to work overnight to clear icy roads.